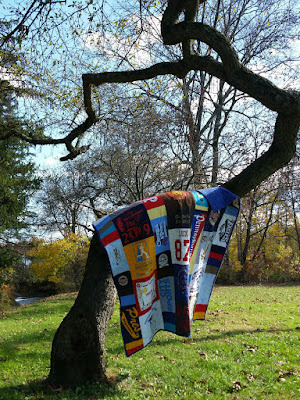 Memory Quilts tell beautiful stories through fabric. This gorgeous Modern style lap size quilt tells an amazing story of a high school runner who also did theater! The bright colored shirts work so perfectly in this quilt. Every MQBM quilt is an authentic quilt with expert sewing, expert long arm quilting, top of the line batting and expert binding! These quilts really do make the best gifts! Each one tells a beautiful story! Memory quilt for any occasion. Holiday quilts are in full swing! It is time to begin thinking about GRADUATION! Yes, we here at MQBM are in full swing producing graduation quilts! NOW is the time to order your graduation quilt or pillow if you are interested in one. Currently, there are 21 quilts in the queue! 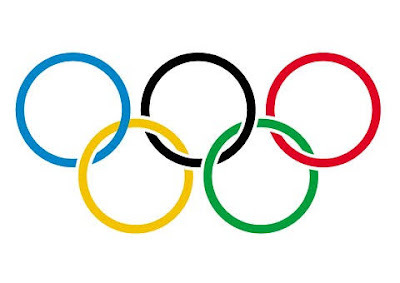 Please know that my authentic quilts contain: expert design using six styles, top of the line batting, expert long arming, and expert binding techniques. MQBM quilts are authentic quilts NOT blankets. Because of this they take a long time to make so please plan accordingly. 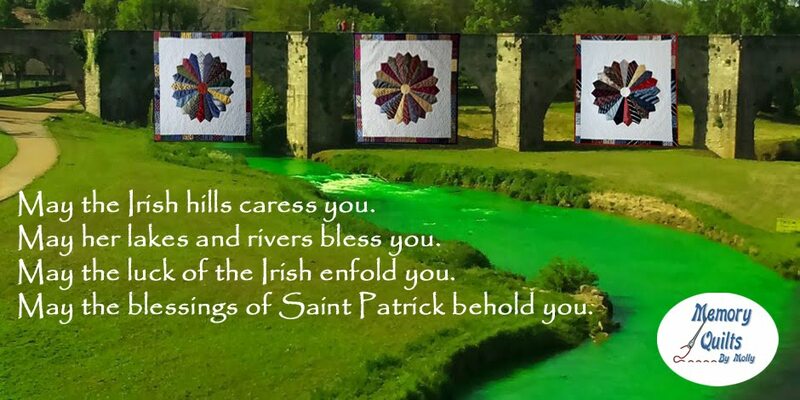 Quilts are taking about 12-14 weeks to make. Pillows only take two weeks plus shipping. An Eagle Scout Quilt, neckerchiefs and all! a queen size custom quilt, plus two baby quilts, made with homemade flannel nightgowns and flannel pants that were gifts throughout the years! A Gorgeous Traditional Style Quilt! Shown here is a a vibrant traditional style quilt made with block sashing. 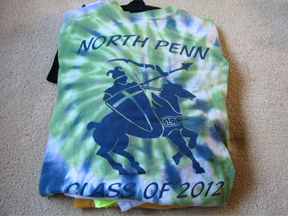 It is filled with swimming shirts and North Penn Blues! Shown here is a twin size quilt. Perfect for the dorm room beds at college. Truly wonderful memories of super fun high school swimming meets. Enjoy this album! 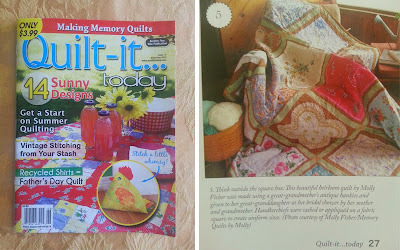 I just received the Quilt-it...today Magazine. 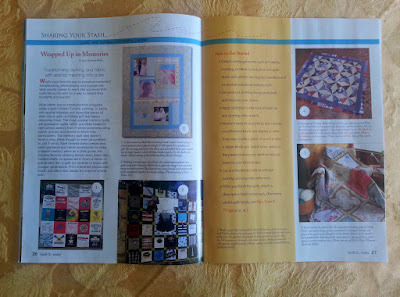 The magazine featured two of my custom quilts on page 26 and 27 of the magazine. I am so very thankful that my work was included in the article! 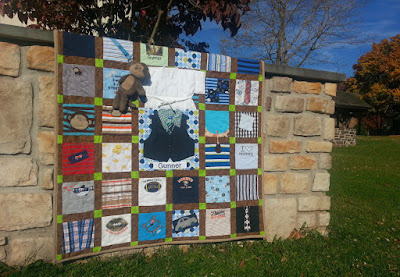 A baby Quilt made with baby's first year adorable outfits and a Hankie Quilt made for a bride-to-be with her great grand moms hankies were highlighted in the article! 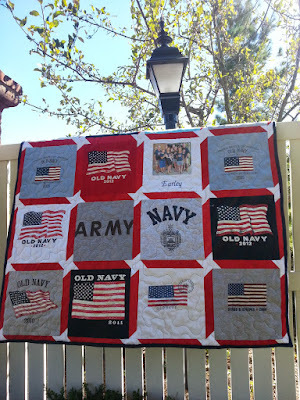 What items do you have waiting to be made into a Memory quilt? Karate Pillows Karate pillows just got even nicer! 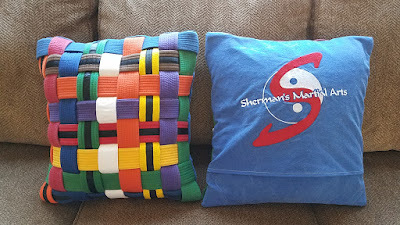 MQBM backed each pillow with the client's Karate uniform that has a special embroidered studio insignia. Gotta love it! 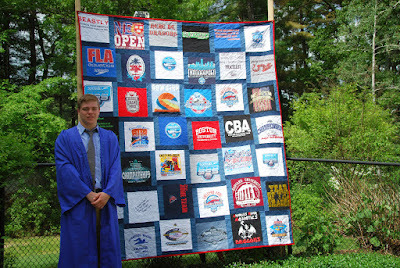 A beautiful Memory Quilt filled with swim shirts for a lucky graduate! 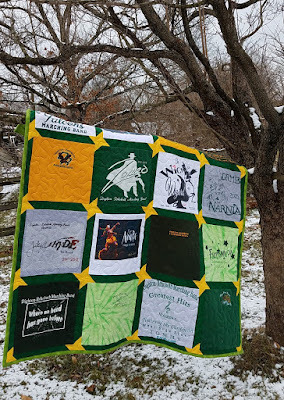 A T-shirt quilt made with love for a special bride!